This entry was posted on May 24, 2013 at 8:17 am and is filed under Action, History, War with tags 1998. You can follow any responses to this entry through the RSS 2.0 feed. You can leave a response, or trackback from your own site. Nice review. The first scene is visually impressive and emotionally powerful. I know some people say the movie falls off afterward but I think it’s very strong altogether. Not my favorite Spielberg movie (that would be either A. I., Jaws, or E. T.), but undeniably one of his best. Thanks man! I think it’s very strong overall as well. There’s no way that Spielberg could maintain that opening 25mins but he does a very fine job. When the battle scenes happen again, they are astonishing. The only only problem I had was the lacklustre script but that takes a back-seat to the action anyway. Fabulous review Mark. This is a really, really good movie. Of course the opening is one of the most visceral and sobering things I’ve ever seen on film. The way Spielberg films it and of course the sting of the reality behind it will leave it lodged in my memory for the rest of my life. But as you say there’s a good movie after that. There’s also some really good performances as you mentioned. It’s just a really solid movie. Good stuff brother. Cheers bro! Yeah, that opening is just so powerfully vivid. I considered giving it a 4.5 as I wasn’t keen on the script but the battle scenes and performances are so good it was hard for me to rate it any lower. The first time I seen the film I was completely shocked by it’s realism and it still has that impact today. That deserves top marks in my eyes. I even like the ending. Some say it feels a little too sudsy. But I had a grandfather who was a Lt. Col. and served in World War II. I can tell you, that scene does ring true with some veterans. I thought it was a perfect finale. In all honesty I wasn’t keen on the whole flag waving side to things. That’s something that doesn’t sit well with me from any nation but it’s understandable why Speilberg would go that route. I can see that it probably is realistic but I’d have to side on the sudsy side I’m afraid. The film isn’t perfect but it’s pretty damn close. Welcome back after your little break! I remember liking this movie when it came out, but to be honest there were so many other great war movies at that time, such as Full Metal Jacket and Platoon that I can’t tell one from the other anymore. It’s just a blur. Need to revisit this one. Thanks Jessica. I’m a big fan of Platoon and Full Metal Jacket as well. In fact, I’ll be featuring the latter in a post very soon. I seen Private Ryan back-to-back with Terrence Malick’s The Thin Red Line. I preferred Spielberg’s take but over time it was Malick’s film that stayed with me most. So much so, that I include The Thin Red Line in my personal top ten. Still, Private Ryan is still a marvellous movie and definitely worth a revisit. It’s not lost any of it power. Excellent work tackling an excellent movie!!! Glad to hear from you, Muckers!! Thank you sir! Yeah, I’ll be back for a bit at least. Run off my feet with all sorts of stuff at the moment. Nice to see you posting again, Mark! I dont know that I could agree that this is his best film… he’s done far too many other GREAT movies, but this is definitely worthy of high praise. I’m going to be rewatching myself this weekend, now you have me anticipating it! I understand that folk will have other preferences of Spielberg’s films. There’s so many to choose from. My mind changes regularly on them but after seeing this the other night, my mind was made up. It’s outstanding stuff. I look forward to your review, man. I’m so happy with your rating on this film. Without a doubt the pinnacle of war films. The first 15 minutes alone deserves every Oscar imaginable. Band of Brothers is a great continuation of this film. I’d side more with Malick’s The Thin Red Line Chris, but this is a very close second. After you mentioned it on my Classic Scene post a few weeks ago, I seized the opportunity for another viewing when it came on TV. It hasn’t lost any of the impact it had on me when I seen for the first time in the cinema. Simply superb! You know I need to go back and watch Thin Red Line. I watched it when I was younger and I don’t think I understood Malick like I do know. I was the same. 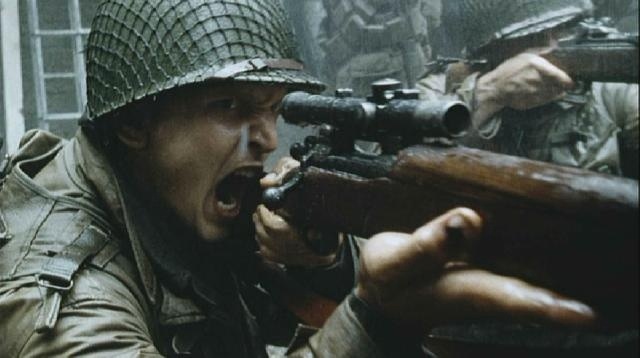 Originally I preferred Private Ryan as I think I was too young to grasp the philosophy of Malick’s film, but as an adult, I grew to adore the movie. The Thin Red Line even makes my personal top ten. Can’t give it much higher praise than that. You should watch it again, it really is something else. I might watch it tonight actually. Now that you’ve mentioned it I would love to see it with a new perspective. I’ll let you know what I think. I look forward to your take Chris. I think Private Ryan (as damn good as it is), unfairly overshadowed the poetic and philosophical nature of Malick’s film. People wanted action and Private Ryan delivered that but The Thin Red Line courses much deeper and isn’t short on a few fantastic action scenes of it’s own. Yes I remember both coming out the same year and I’m one of those people that preferred the action over Malick’s deeper style. I think after a rewatch it may switch though. Well, it definitely switched for me. Private Ryan was once in my top ten many moons ago. Now it’s Malick that makes the cut. Did you like his 2005 film The New World with Colin Farrell? Now that is one I’d have to revisit. I was disappointed in it. I expected so much more from it. It’s funny you mention it, I was going to watch that last night. I will get around it at some point. Visually it was outstanding, as Malick normally is, but I found it a bit tedious. Yes one of his tedious ones but I liked it. Tree of Life was amazing. I expect that I’ll appreciate The New World more when I sit down to it again without high expectations. I expected another Thin Red Line and it didn’t match that for me. The Tree of Life was another beauty. It has it’s critics but I adore that movie. Thats another top star rating. Great review Mark and good to see you back! This really is a great film and will be remembered as one of Spielberg’s best, without a doubt. War veterans have said that the opening is the closest thing they’ve seen to reality, which is about as high a compliment you can get really. Thanks Chris. It’s good to be back. Thought I’d return with one of my favourite movies. I’d heard that veterans were in tears when they saw this film. It took them straight back and Spielberg was given numerous military and humanitarian awards for his realistic depiction of what it was like. Thanks Tim. Glad to hear you’re a fan also. It’s brilliant stuff. Fantastic review. This is one of those films I probably would pass out if I watch it from the gruesome realism of war… that said though, perhaps one day I would muster up the courage to see it. I know my hubby has seen it and he has great admiration for it. That’s great that you’re able to ‘bond’ with the characters as you said, and that’s a recipe of a film’s endurance I think. I feel that way w/ The Thin Red Line (which I have seen as it’s nowhere near as violent as this one). It’s good to be back Ruth. Thanks! Yeah, I did bond with the characters and I think that does go a long a way for the film. You can actually imagine yourself being thrust into this chaos as so many young men were at that time. It was tragic. I’m a big fan of The Thin Red Line and prefer it slightly over this but the battle scenes here are some of the best and most realistic I’ve ever seen. I’m sure many will agree on that and that’s what makes it hard to sit through. Fantastic film but not easy viewing by any means. I’ll take your word for it about the realistic depictions, but that’s just it, I don’t think I could handle it. I was reluctant in seeing The Thin Red Line until Ted assured me it’s not a violent war flick. I really like that one as it’s mostly about the soldiers’ psyche and it made me even more of a fan of the so-underrated Jim Caviezel. Yeah, The Thin Red Line was very poetic (if a war film can ever be described as such). I love it and include it in my top ten. The film just gets better with every viewing. Caviezel was fantastic in it. He can portray a tortured soul very well. I particularly liked Nick Nolte in it. He snarled his way through every scene. Oh yeah, Nolte too, another underrated actor. I heard that lots of actors’ screen time were cut significantly (i.e. Adrien Brody) and I think Jim was supposed to only be a supporting actor in it, but ended up being the lead. I LOVE actors who could do ‘tortured soul’ very well, as you put it. Jim is naturally a soulful kind of actor too, and for a time I described GB in the same way but now I think he’s not as um, understated as he used to be. Yeah, Gary Oldman, Viggo Mortensen and Mickey Rourke were just a few who’s scenes were cut entirely. Billy Bob Thornton also recorded a VoiceOver that was decided against as well. Like you say, Brody’s role was apparently a lot bigger. Only Malick would have the performances of the likes of Gary Oldman, Viggo Mortensen and Mickey Rourke in the cutting room floor!! Ahah, well I think Caviezel’s ‘downfall’ was playing Christ in a movie by one of the most hated man in Hollywood, which is a shame as his performance was outstanding. I love how you’re so fiercely loyal to your compatriot. Well, I haven’t written GB off completely, though it worries me a bit that he hasn’t committed to anything I’m eager to see. Yeah, only Malick could get away with that. It just shows you how many people wanted to work with him after self-imposed exile for so long. You could say that Gibson has been the reason for Caviezel’s downfall which is a shame, as he was excellent in that movie and really committed himself. Great timing on this review. Does the UK have a “Memorial” day? The influence this film has is far greater than “Thin Red Line”. From video games, movies, TV series, this is the one Americans think of when you say WW2 movie. The summer of 98 I was in St. Paul’s Cathedral by the plaques honoring America’s veterans of WW2. Behind me an Englishman was muttering something about the “damn Yanks”. Fine I thought, after all there were millions of us who didn’t want to be here in the first place. But to those that were and paid the price for the rest of us, homage must be made. 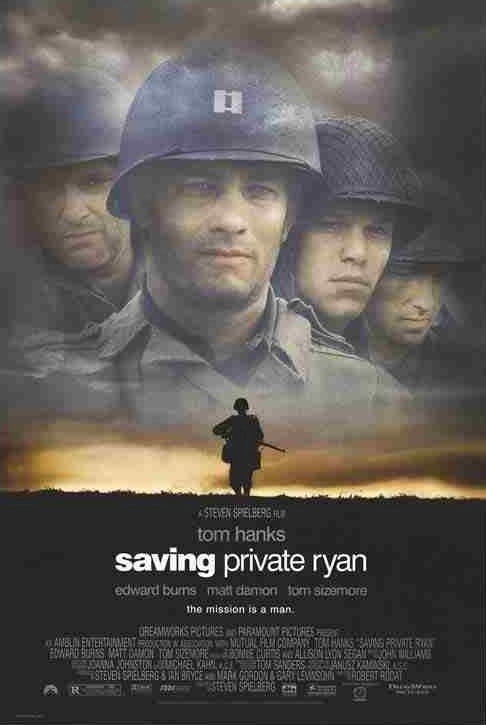 “Saving Private Ryan” is Spielberg’s homage! The timing of this post was purely accidental Ray. I only found out today that the US are having a memorial day. The UK have a similar deal but I think the dates are different, or I’ve got it wrong altogether. You make a good point there, this could be seen as Spielberg’s homage. It was something that stuck in my head when watching it, though. Not one other nationality was considered, but it’s a small gripe at the end of the day. The film’s still an absolute beauty in my eyes. Excellent post, that opening battle is so haunting and well-executed. It is indeed Vinnie. Some of the finest filmmaking I’ve ever witnessed. Thanks man! Cheers bro. It’s good to be back and conversing again. I understand your reasons for it falling short of a 5. It’s not perfect and I seriously considered 4.5 but it’s just so powerful it’s hard not to award it with top marks. After my recent revisit, I realised that it’s a timeless movie and will probably never age. That counts for something too. Still hard for me to believe ‘Shakespeare in Love’ beat it for Best Picture that year. Fine look at this, Mark. I’m astonished that Shakespeare In Love beat it as well, Michael. It’s one of the Oscars’ biggest blunders. Thanks my friend. Nice review Mark! This is one of my all time favorite war movies. I remember going to see this in the theater and I almost pissed my pants during the D-Day invasion. It was amazing. To this day I still use it as reference for my audio visual set ups. If I get a new receiver or new speakers the first thing I think about is throwing in this blu ray. The only thing I can think of that tops it for me is the Band of Brothers series that was HBO. Thanks Griff. I was the same. I must have been about 19 or 20 when it came out and it totally blew my mind. My dad was a big WWII enthusiast and it was him that dragged me along. I’ll always remember that experience. D’you know I’ve never seen it on Blu-Ray. That’s something I should really look into. Loved Band Of Brothers as well. Excellent series. I am glad you did not piss your pants as I was sitting next to you. LOL. You didn’t feel a warm sensation creeping in from the side did you Adam? Quite the movie and review to come out of hibernation with. Great war film with incredible sequences. Thanks Nick! I thought I’d return on a high note with one of my favourite movies. I was lucky enough to catch it again while I was having a break and decided this was the one to go with. Superb movie! Love this movie but it is still my second favorite war film released that year. This film makes me wish Spielberg would always skip the syrup that he has been pouring on his recent films. Despite my love for it, it was also my second favourite as well Adam. Malick shades it for me. I know what you mean by Spielberg and his syrup. He certainly does have a sweet tooth sometimes doesn’t he? There are glimmers of it here also but he restrains himself enough. Welcome back, Mark. Great review. Great review of a great movie, Mark. It still amazes me that Shakespeare in Love beat this AND The Thin Red Line. Thanks Garrett. It certainly is an excellent film. It was Michael that mentioned earlier in the the comments about Shakespeare In Love beating it to the Oscar but you rightly bring up The Thin Red Line as well. As far as I’m aware Malick’s movie walked away with absolutely nothing. It’s criminal. Good stuff mate. Excellent movie, and the beach storming scene is one of my all time favourites. Cheers bro! Fantastic film and I’d second your opinion of the beach storming. It’s some of the most impressive filmmaking I’ve witnessed as well. Very nicely done. An average film bookended by two incredible battle scenes. This will always be remembered for the enormously influential opening D-Day landings scene, which remains one of the most powerful experiences I’ve had in a cinema. Shame it dips badly after that. Thanks man! I know a lot of people who found that it dipped after it’s superb opening but I actually found it still delivered some very memorable moments. The conventional plot was my biggest gripe but I enjoyed the dynamics between the characters. Top marks may be a bit too high for some but it deserves them for the battle scenes alone. Outstanding movie here. Great review. Thanks man! It certainly is outstanding. Not without flaws but they are easily overlooked. So glad you gave this one 5/5, I totally agree that it’s Spielberg’s finest film. Now I want to go back and watch it again… damn you finals! Thanks Andy. I know what you mean by time constraints. I just managed to squeeze this review out. I’m totally swamped with stuff as well and had very little time for blogging. Still, it good to get a chance to revisit a favourite and still not be disappointed after all these years. After many viewings of ‘Saving Private Ryan’ I still stand by my opinion after its first viewing. Outside of its opening 20 minutes and principals getting off the beach. ‘Saving Private Ryan’ is nothing more than an extended episode of ‘Combat!’ from ABC in the 1960s. Though the series managed to pack a film’s worth of action into a 52 minute episode each week. Especially when the series was in B&W before shifting to color in its fourth season. ‘Saving Private Ryan’ is well cast, detailed, shot and edited. But nothing I haven’t seen before. Good to see you dropping by. I never actually seen any of ‘Combat’. I’m not sure if it even made it onto UK screens. It sounds good, though, but Saving Private Ryan was completely new to me, so for that reason it had a bigger impact on me. The opening 20+ mins and the 50 min battle sequence at the end were absolutely jaw-dropping stuff. I also liked the more personal conflicts peppered throughout the mid-section. The conventional plot was hard to swallow but I still couldn’t criticise the film when it’s battle scenes were so vividly depicted. Not my favourite war film but still pretty damn good in my eyes. During the 1960s the migration of TV series was definitely from the east and the UK coming west to the US. I still remember ‘The Avengers’ and “The Champions’ making their way here while very little went your way in kind. Before Vietnam took over television here, there were many WWII themed series on the big three stations. With ABC’s ‘Combat!’, ‘Twelve O’clock High’ and later, ‘The Rat Patrol’ far in the lead. Followed closely by ‘The Gallant Men’ in terms of quality and story. So the pallet was larger and sometimes more memorable. Thanks Jack, that a nice little rundown of so many shows I’ve never heard of. Thankfully, we get all (or most) US shows now. I couldn’t have done without a lot of them. What’s your take on Band of Brothers and have you seen The Pacific show? The latter is one I’m very interested in. Never even noticed that about Danson’s torch in that scene. I’ll look out for that next time. I really had problems with the movie–as do I with Spielberg as a filmmaker. Although I especially found SPR to be a rip-off movie; I saw nothing of an independent vision. Hey Thomas, good to see you, man. Sorry to hear the film didn’t work as well for you. I can’t totally see why some would have issues with it. I do too, but those issues are easy to overcome when most of what’s onscreen is so impressively handled. I don’t normally go in for Spielberg and his schmaltz but I thought he kept it too a minimum here. Thanks man.